In online news, there's "clickbait," a sensational headline which doesn't reflect the underlying story. The New York Daily News took that concept into the front page of its Tuesday print edition. Its headline — "DADDY'S LITTLE GHOUL" — included a photo of Ivanka Trump. The underlying article mentioned her only once in passing. We should call this "printbait." The paper's related clickbait tweet reads: "Deplorable: An early look at Tuesday's front ..."
That adjective perfectly describes the front page. There is no journalistic justification for the Ivanka-themed front page. 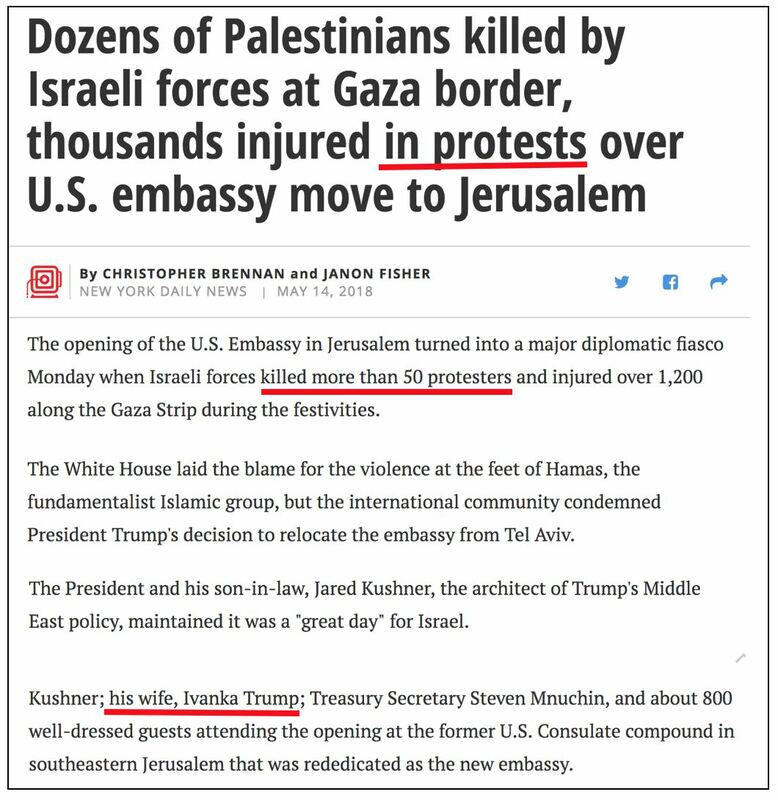 The Daily News pair used forms of the word "protest" three times in their write-up and twice in a single photo caption to describe Palestinians attempting to break into Israel, actions they called "demonstrations." This is Hamas’s longstanding strategy: The more Palestinian young men die, the more hellish the conditions of Palestinian neighborhoods, the more sympathy aroused in Western media. Hence Palestinian rioters’ destruction of the only cargo passage through which cooking fuel can get to Gaza’s 2 million residents. The act of vandalism appears senseless unless you understand Hamas’s aim is to make Palestinians destitute for the benefit of Western media. Yesterday's U.S. embassy move to Jerusalem from Tel Aviv marked the follow-through on an action Congress expected to take place in 1999 after passing a related law in 1995. It also follows a unanimous June 2017 U.S. Senate resolution calling on President Trump to "abide" by that law. He has. The Daily News clearly isn't happy about that. Hence the childish "printbait" front page.